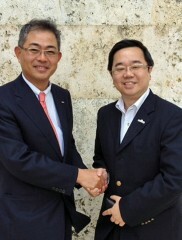 Haiteng Chen (on the right), CEO of Baidu Japan which has an agreement with the Mizuho Bank to establish a cooperative relationship to secure Chinese customers and develop a presence in the Chinese market, and Hideyuki Miyamoto, head of the Naha branch office of the Mizuho Bank at Naha Airport on December 2. Haiteng Chen, Chief Executive Officer of Baidu Japan Inc. visited Okinawa from December 1 to 3, for meetings with leaders of the prefectural government and representatives of local companies. Baidu Inc. (President Alan Zhang) is a Chinese web-services company that boasts an 83% share of the Internet search market in China. Okinawa is the first place in Japan that Chen has visited to consider the situation since the setting up of an agreement between Baidu Japan and Mizuho Bank to cooperate in order to acquire Chinese customers and Chinese market development. He met representatives of about 20 organizations, including local companies, people from the Okinawa Prefectural Office and the Okinawa Convention & Visitors Bureau. Ahead of the 40th anniversary of the normalization of diplomatic relations between Japan and China, and the 40th anniversary of the 1972 reversion of Okinawa to Japan, Chen explained the services provided by Baidu Japan since the introduction of multiple-entry visas for Chinese tourists and the arrangements needed for the establishment of direct flights from Beijing to Naha. Maldives is the most popular foreign destination for Chinese people as a location for resort weddings. Chen said that in terms of popularity ratings in China, Okinawa competes with Hokkaido and Jeju Island in South Korea, and he emphasized that Okinawa needs to work out a strategy to create a point of difference when compared with locations in other countries. Japanese companies are now registering themselves in Baidu’s paid search listings, allowing their addresses to appear on the search results pages of Baidu. It is reported that since the last fiscal year, thanks to Baidu’s paid search listings Rakuten Travel has improved its performance in the number of hotel reservations in China by eight-times.